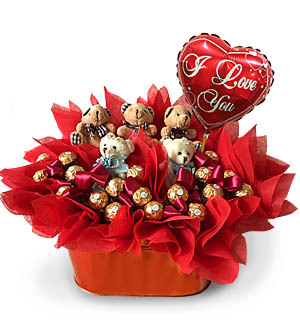 Sweeten someone's heart with a pot of Ferrero Rocher 18pcs, a cutesy bears 5pcs and a "I Love You" 9" foil balloon. Cutesy bears comes in various design and may be different from pot to pot. For outstation delivery within Malaysia, deliveries are made via courier with at least 3 working days notice. Contact our us @ Pods & Petals Giftlab at +603-78830233 / +6012-6915200 or sales@gift-lab.com for enquiries.